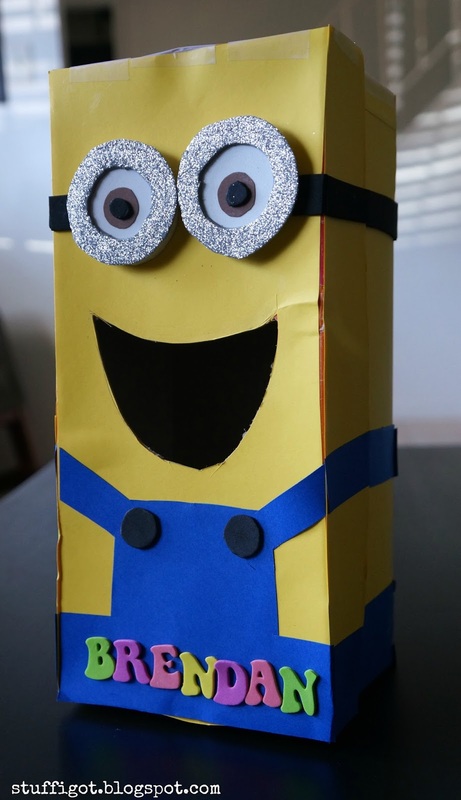 I wanted to do a quick post about the Valentines Box my kindergartener and I made the other day. This was the first time a teacher asked us to make a box to hold the Valentines the kids would be receiving in class. Usually, my kids either decorated a paper bag or a little box at school. 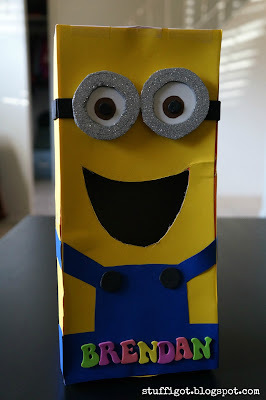 I went on Pinterest and did a search on Valentine Boxes and when my 6-year-old saw a Minions one, he got excited and immediately said that was what he wanted! It didn't look too hard and we had most of what we needed already at home. First, we needed a shoe box. Luckily, we found one in my older daughter's closet that was a good size. 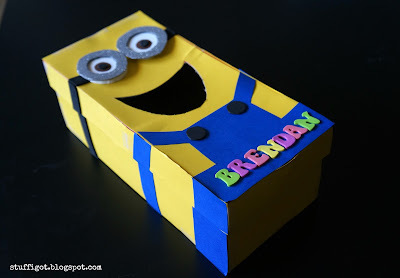 I covered the box and its top in yellow cardstock. This part probably took the longest, since I had the cut all the pieces out and glue them onto the box. Next, I cut out some blue cardstock for the Minion's overalls. I tried to cut somewhat identical pieces for the front and the back of the box. I also cut straps for the sides of the box. After that, I cut out some white foam circles for his eyes. I used a plastic ring from a Tying Knots game. I traced the inside of the ring on the white foam paper and I used a glittery silver piece of foam for the goggles. I made the iris and pupil with brown and black cardstock. I made the goggle straps with a piece of black foam paper. The boxes had to have the child's name on the front, so I used some foam letter stickers that I had to put his name on the overalls. I sketched out a mouth for the Valentines to go in and my husband cut it out with an Exacto knife. I think it came out super cute! 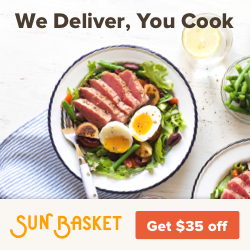 I can't wait to see how well it held up in class!